Last Friday evening, my graduate school cohort assembled to celebrate Emily H's birthday. After watching far too much Cake Boss and Food Network Challenge over winter break, I decided to bake a five-layer, half-funfetti, half-devil's food birthday cake with cream cheese filling and chocolate icing (topped with sprinkles, candles, and a frosting "E-hat," like an E with a carrot ^ on top, which is statistical notation for "predicted Emily" - yes, grad students are nerds). Apparently, there is no photographic evidence of the intact baked good, but I assure you it would have given Buddy Valastro a run for his money :) Most of the cake was salvaged by Sarah and Maria, the majority of the candle hazards removed from the rubble, and everyone enjoyed a ladle-full with the birthday girl. During our phone conversation Monday night, my Boyfriend made the astute observation that my opinion of blogs seems to have flip-flopped recently. He's right, I have historically expressed disdain for self-promoting, grandiose blogs - it's as though the authors actually believe that other people (some sort of blog-oriented sphere) care what he/she has to say about [celebrity fashion/quilting/video games/cute kittens - OK, maybe kittens are acceptable]. And now (gasp!) I am one of those authors! What changed? 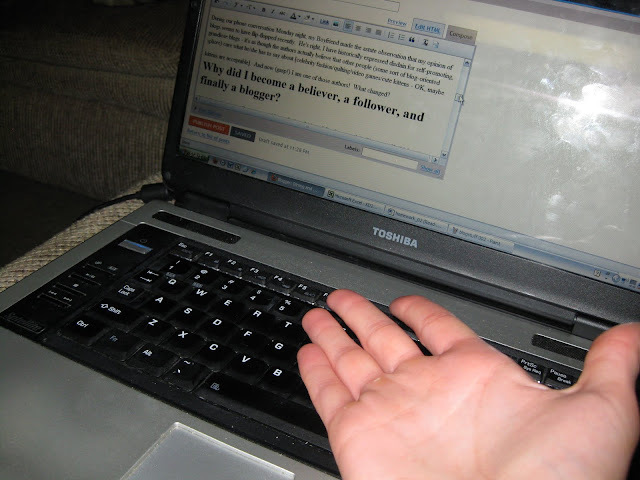 Why did I become a believer, a follower, and finally a blogger? I can identify with the bloggers. The topics they cover are relevant to my life and the authors are down-to-earth, approachable. The posts are really, really well done. They are smart. They contain lots of interesting, useful information. Plus, the photos and stories and fun stuff are super appealing. I would love for this blog to follow that example. In other words, I want to write a blog that I would actually want to read. Which hopefully means it'll be a blog that you actually want to read. Firstly, I will post more and better pictures, especially of food. Seeing pictures, actual evidence of other people's culinary triumphs (or failures), fitness triumphs (or failures), and general life pursuits, often inspires me to take on a new challenge. And when those pictures make the food look delectable, the fitness look extra invigorating, or the other random stuff look really fun, it works even better. So, I will develop my photography skills (still lives and action shots) to the extent possible with my little silver Cannon PowerShot SD1100 IS. Oh no, a scratch! I'm so sorry, baby camera! Secondly, I will enforce order and organization in my posts. Thirdly, I hope to post on topics of relevance and value to you all! More than just egocentric prattlings, I plan for these posts to contain interesting information presented thoughtfully that might actually spark discourse amongst readers. Or, at least some of the time! I'm not expecting to start a revolution or collect the impressive followings of the bloggers who've inspired me. But, I would like to create a product that I can feel proud of, and one that you all will appreciate. At the end of every post, I am going to include a reader question! I've noticed this tactic being employed to great success on other blogs. If you feel so compelled, then please, by all means, add a comment. It can be in reply to the question or not, a reaction to the blog or a completely unrelated thought. Whatever the comment, it will help me build a better, more engaging blog. Don't be shy! I should say that my former reservations about blogs are now relegated to Twitter - who seriously wants to hear everyone's every waking thought?? But, this cynicism comes from someone who regularly updates her Facebook and gchat statuses (stati? ), and now, of course her blog. So, perhaps I should not be so quick to judge. Hope everyone is having a beautiful, active, and productive week! Can't wait to hear your comments, and I'll be back with a new posting this weekend! Don't be scared to post a comment - I'm pretty nice! Today's question: What do you look for in a blog? What elements of other blogs have worked for you, and what haven't? What topics would you like to see me address, what do you wish I would avoid? When it comes to blogs, what makes you click back for more? I just came across your blog from your absolutely AWESOME helpful comment you left on my blog the other day about running. I really appreciated that. As for your blog, I'm new to it but I do have a few suggestions. It's a bit hard to read the print on the black background and it could be just me but I wanted to mention it. I would love to defintely read more about running (since I'm brand new to the sport). As for what I look for in a blog truthfully, I'm surpised that more bloggers don't monetize their blogs (using affiliate links to products). I do almost all my shopping online and would love to support more of my fellow bloggers. Oh and it's much easier to comment and read Wordpress blogs. I wonder if you have ever looked into buying a domain name and setting up a Wordpress blog using a hosting account (I'm talk about Wordpress.org, not .com). I'm really interested in fitness more than food but it's definitely helpful to see what healthy foods people are eating out there to get ideas for myself. Hope the input helps and if you have any questions feel free to touch base with me. I'm really excited to keep up with your blog. Hi Angie! Thank you so much for commenting!!! As you can see, I've already taken your advice about the colors (and gotten into the HTML code a little bit to play with the template) - what do you think? Also, it's interesting that you should mention monetizing... I've been debating/wondering if it's either a really awesome way to make some change or if it's actually a little slimy... That said, I just signed up for AdSense, so we'll see how it goes! There will definitely be more posts about running (and fitness in general), but, as my first post mentions, the eating part is as important to running as the actual running part :) Keep an eye out for a post on fueling for your runs in the near future. Very nice now. It shows your sense of humor,yet is more helpful to others. I know you prepare very healthy budget meals, sometimes without strict recipes. I'd love to have you write down the ingredients and preparation, and made include a picture. I would enjoy hearing about your study of the human brain, your running, and if you start singing in a group or solo again, that as well! I love the new blog colors, and the photos/ charts are fabulous. Take your camera running! Even if it's just for one photo a run! Don't let anyone, even yourself, tell you that you have nothing to blog about, it is simply not true! so happy about this blog! i love this post! you've obviously given a lot of thought to what makes a good blog, and how to employ that in your own. also, thanks for commenting on my blog. i, too, am in awe of my favorite sites and definitely look to other bloggers for inspiration but also as friends even though we don't really know each other. it's great to get a glimpse into other people's lives. 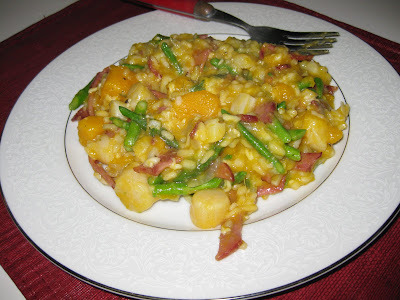 and how about a post with the recipe for that risotto? it looks AMAZING! I think what most people look for is personality. You have it. It just takes time. Jasmine, I'm not sure if you'll see this reply, but I'm having trouble posting a comment on your blog. I had the same issue with my own today -- I'm pretty sure it's some setting on this computer that doesn't gel with blogspot -- and switching to popup comments fixed the problem. Anyway, wanted to say THANKS for the comments, and that your story is amazing!!! Do you feel so great about how you look in photos now?? ?